626 Night Market The OG night market has FOUR weekends this year, so you truly have no excuse to miss this always-fun-as-hell event. 626 Night Market Arcadia The OG night market has FOUR weekends this year, so you truly have no excuse to miss this always-fun-as-hell event. G2 Green Earth Film Festival A free, enviro-focused film festival -- with free food and drinks. G2 Green Earth Film Festival Venice A free, enviro-focused film festival -- with free food and drinks. Festival of the Chariots A parade from Santa Monica to Venice, brought to you by the Hare Krishnas. What lies at the end, you ask? An enormous Indian feast. Festival of the Chariots Main St, Santa Monica to Ocean Front Walk Plaza, Venice A parade from Santa Monica to Venice, brought to you by the Hare Krishnas. What lies at the end, you ask? An enormous Indian feast. Sundance Next Fest Up-and-coming bands meet up-and-coming movies. Sundance Next Fest The Theatre at the Ace Hotel Up-and-coming bands meet up-and-coming movies. LA Craft Beer Crawl The wizards at 213 Hospitality have put together a beer crawl that’s less of a beer crawl, and more of a mobile beer festival. You’ll hit some of their best spots, including Casey’s, Seven Grand, Honeycut, Golden Gopher, Las Perlas, Cole’s, and the Varnish. Oh, and there will be over 100 beers to sample. LA Craft Beer Crawl All over DTLA The wizards at 213 Hospitality have put together a beer crawl that’s less of a beer crawl, and more of a mobile beer festival. You’ll hit some of their best spots, including Casey’s, Seven Grand, Honeycut, Golden Gopher, Las Perlas, Cole’s, and the Varnish. Oh, and there will be over 100 beers to sample. Nisei Week Japanese Festival A week long celebration of Japanese culture and community, complete with -- duh -- a parade. Nisei Week Japanese Festival Little Tokyo A week long celebration of Japanese culture and community, complete with -- duh -- a parade. So Cal Hoedown This rockabilly-and-more fest features headliners like legendary showwoman Wanda Jackson and the rowdy Supersuckers, as well as a car show, burlesque dancers, and more. So Cal Hoedown Downtown Santa Ana This rockabilly-and-more fest features headliners like legendary showwoman Wanda Jackson and the rowdy Supersuckers, as well as a car show, burlesque dancers, and more. Brave Fest A “Gen Z” music festival, Brave Fest is geared towards connecting emerging musicians, social media stars, and creative activations with our adorable young generation. Brave Fest Pershing Square, DTLA A “Gen Z” music festival, Brave Fest is geared towards connecting emerging musicians, social media stars, and creative activations with our adorable young generation. Echo Park Rising Echo Park will be overflowing with this totally free, four day music, food, and art festival with more local bands than you can shake a stick at, including Coachella vets Chicano Batman and punky rockers Fakers. Echo Park Rising All over Echo Park Echo Park will be overflowing with this totally free, four day music, food, and art festival with more local bands than you can shake a stick at, including Coachella vets Chicano Batman and punky rockers Fakers. LA Food and Wine Festival LA’s premiere food festival is back for round six, and promises nonstop chefs cooking nonstop food all over the city. LA Food and Wine Festival All over LA LA’s premiere food festival is back for round six, and promises nonstop chefs cooking nonstop food all over the city. OC Night Market The biggest Asian-themed night market of the 626 will be crushing the OC again this year. Check out more than 200 vendors, complete with food, beer, art, and music. OC Night Market Costa Mesa The biggest Asian-themed night market of the 626 will be crushing the OC again this year. Check out more than 200 vendors, complete with food, beer, art, and music. Summer Breeze Festival The silky smooth soul and R&B fest is gearing up for its second year, and you need to get in on that. Especially because Keith Sweat will be there. Summer Breeze Festival The Queen Mary The silky smooth soul and R&B fest is gearing up for its second year, and you need to get in on that. Especially because Keith Sweat will be there. 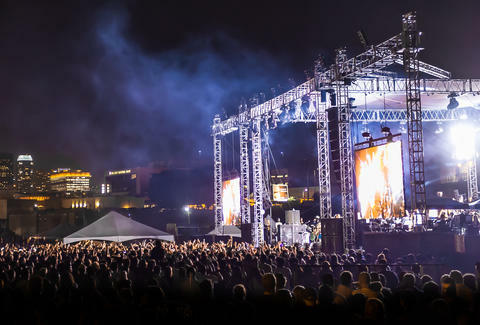 FYF Fest Like Coachella’s really cool cousin, FYF is bringing headliners like Kendrick Lamar and LCD Soundsystem to the table this year, as well as not-to-be-missed acts like Tame Impala and Explosions in the Sky. FYF Fest Exposition Park Like Coachella’s really cool cousin, FYF is bringing headliners like Kendrick Lamar and LCD Soundsystem to the table this year, as well as not-to-be-missed acts like Tame Impala and Explosions in the Sky. 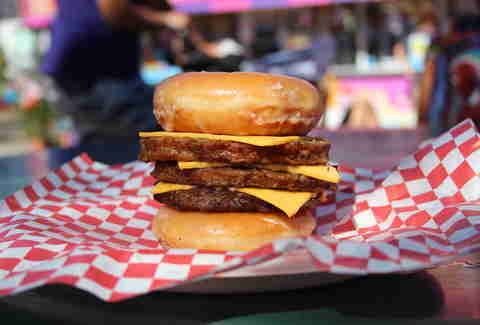 LA County Fair The LA County Fair returns, with rides for days, live music, beer gardens, and of course, fried Twinkies. LA County Fair Pomona Fairplex The LA County Fair returns, with rides for days, live music, beer gardens, and of course, fried Twinkies. E Hula Mau A huge celebration of all things Hawaiian, including food, music, and hula/chant competitions. E Hula Mau Long Beach Performing Arts Center A huge celebration of all things Hawaiian, including food, music, and hula/chant competitions. The Taste Curated by LA Times, The Taste features three days of high-end food and seminars from names as big as the patron saint of LA strip malls, Jonathan Gold. The Taste Paramount Studios Curated by LA Times, The Taste features three days of high-end food and seminars from names as big as the patron saint of LA strip malls, Jonathan Gold. 626 Night Market The OG night market has FOUR weekends this year, so you truly have no excuse to miss this always-fun-as-hell event. Plus, on Labor Day weekend, they’ll be open 'til 1am. 626 Night Market Arcadia The OG night market has FOUR weekends this year, so you truly have no excuse to miss this always-fun-as-hell event. Plus, on Labor Day weekend, they’ll be open 'til 1am. Labor Day Music Festival Snoop Dogg will be headlining this year’s festival to benefit low-income communities. Labor Day Music Festival Exposition Park Snoop Dogg will be headlining this year’s festival to benefit low-income communities. Folk Revival Festival This year’s folk-and-more fest will feature headliners like The White Buffalo and Chuck Ragan. Folk Revival Festival Rainbow Lagoon Park, Long Beach This year’s folk-and-more fest will feature headliners like The White Buffalo and Chuck Ragan. Downtown Film Festival It’s not as bigtime as its cousins AFI and LAFF, but the Downtown Film Fest still boasts great movies and stars. Downtown Film Festival Downtown It’s not as bigtime as its cousins AFI and LAFF, but the Downtown Film Fest still boasts great movies and stars. Luckyrice Slurpfest So many noodles, with the high-profile ramen lineup still TBA. Luckyrice Slurpfest Location TBD So many noodles, with the high-profile ramen lineup still TBA. Luckyrice Moon Festival Cocktail Feast An all-you-can-drink cocktail party... with great food. Luckyrice Moon Festival Cocktail Feast Alexandria Ballrooms An all-you-can-drink cocktail party... with great food. Music Tastes Good Festival KCRW is bringing music and food fans together with this festival in Downtown Long Beach, featuring acts like The Specials, Iron & Wine, and Dr. Dog. Three-day tickets are only $120, so, take that Coachella. 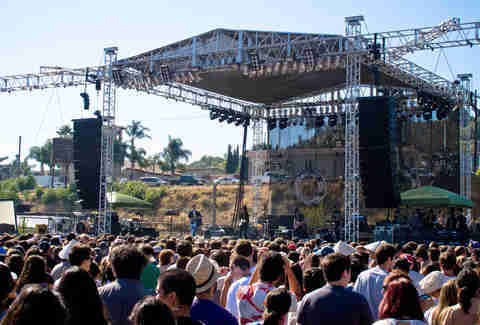 Music Tastes Good Festival Downtown Long Beach KCRW is bringing music and food fans together with this festival in Downtown Long Beach, featuring acts like The Specials, Iron & Wine, and Dr. Dog. Three-day tickets are only $120, so, take that Coachella. LA Podcast Festival Tons of popular podcasters will be at LA's biggest podcast event, including Aisha Tyler and Matt Besser. LA Podcast Festival Sofitel Los Angeles Tons of popular podcasters will be at LA's biggest podcast event, including Aisha Tyler and Matt Besser. The F****** Catalina Wine Mixer Gourmet food, wine, DJs, live bands (including The Dan Band), and of course, a screening of Step Brothers. The F****** Catalina Wine Mixer Descanso Beach, Santa Catalina Island Gourmet food, wine, DJs, live bands (including The Dan Band), and of course, a screening of Step Brothers. Abbot Kinney Festival Four stages of music and spoken word, three beer gardens, and all the food you could stomach. You want to go to there. Abbot Kinney Festival Abbot Kinney Four stages of music and spoken word, three beer gardens, and all the food you could stomach. You want to go to there. Newport Beach Wine & Food Festival Celebrity chef (like Nancy Silverton) cooking demos, wine tastings and seminars, cocktail and beer tastings, and all the food you can stomach. Newport Beach Wine & Food Festival Newport Beach Civic Center Celebrity chef (like Nancy Silverton) cooking demos, wine tastings and seminars, cocktail and beer tastings, and all the food you can stomach. Desert Daze Another J-Tree music festival, but with much bigger acts like The Brian Jonestown Massacre, Deerhunter, and Thao & the Get Down Stay Down. Desert Daze Institute of Mentalphysics, Joshua Tree Another J-Tree music festival, but with much bigger acts like The Brian Jonestown Massacre, Deerhunter, and Thao & the Get Down Stay Down.